So I thought that I would ask Ashton about how social media has helped him along. It's hard to say what the absolute first was, because I was very young when I started reading them, and child memory is fuzzy on chronology. 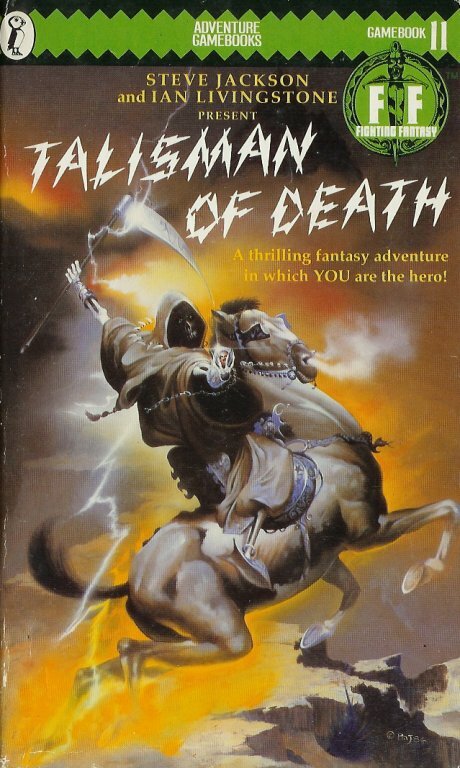 But one of the first, anyway, that made a strong impression on me was Talisman of Death by Mark Smith and Jamie Thomson. The internet doesn't seem to have much to say about this book now, but man, at the time, I loved it. Oooh... tough one. 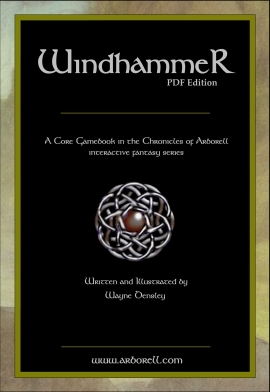 I'm going to cheat a little bit and give a collection, rather than a single book: the Windhammer Short Gamebook Fiction Competition entries. As a whole. A lot of them individually have flaws, but as a collection, there's more inspiration and creativity there than I've seen anywhere else. Honestly, I think I would refer them to the Gamebook Adventures series published by Tin Man Games. The older books have nostalgia value, but that won't matter to a newbie, and the older books don't live up to the standards gamers today expect. The TMG games are solid, and I think they will appeal to newbies and veterans alike. 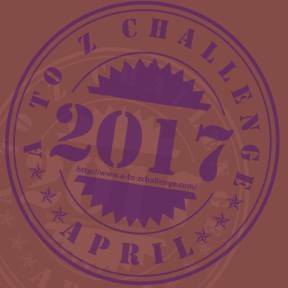 An interactive story, in which the reader makes choices that affect the course of the narrative. I personally just love the element of interactivity. I mean, for me, I love games and I love books. Gamebooks are a way to bring together these two passions. I get a cool story, but there's also an element of personal involvement, which you don't get while reading. While reading a normal book, you don't get to make any choices. You can't ring up the auther to say, like, "Hey Steve, I think the Shining should have a different ending." Gamebooks put you in the story. It's awesome. All over the place. I get inspiration from other stories, from history, from off comments made by friends. I often find that when I need ideas, they're not there, but when I'm not looking for them, they show up all over the place. What I've taken to doing is keeping notes in a "Seed Ideas" folder for little concepts that could grow into whole stories. When it's time to start a new project, I go riffling through the folder for one I like. I don't know how to stop my brain from making game systems. Something about game systems just engages my imagination. Like, if you go back through my school notebooks, all through high school and college, the front half of any given notebook is class notes, the back half is notes for some game system that never saw the light of day. It's very exciting to me that gamebooks give me a chance to put some of my system ideas into a polished, presentable, usable form. Make the interactive element meaningful. For me, that often means thinking up the different endings. I want each ending to, by itself, make a satisfying story. When writing straight fiction, I often find myself thinking, 'well, what if it went this way? What if this character did that instead?' and with gamebooks, I can explore that. But if the choices the reader is asked to make are essentially filler that don't make any difference to the story, then I don't see the point. It's secret... :D No, I have a few ideas burning at the moment. One is a dark fantasy story of personal redemption set against a harsh, desert backdrop. Another is a post-apocalyptic story with giant robots. A third is a steampunk murder mystery. Farther down the production lineup are ideas for a horror/ghost story set in an art gallery in modern New York. Or a time-bending space fiction story, sort of Firefly meets Dr. Who. There's too many ideas to really write them all, so I just need to pick one and run with it. Or, you know... 3 or 4. I can never manage to keep myself focused on just one writing project at a time. Did you have any reservations about social media before you started using it? Yes. There's some bad publicity for a lot of social media. It can be cool to reject it... if only because it's so popular. But once I got on board, I'm finding that I really do see the point. The gamebook world is a small community. There's maybe a dozen or so of us, and none of them that I know of, except me, live in California. If I weren't using social media, I wouldn't be able to participate in being a member of that community. What has happened since using Twitter? Would you do anything differently if you could start using Twitter again? I came to Twitter late enough that by the time I got there, I had a pretty good idea of what I wanted to use it for. The only thing I'm still working on is balancing social media with actually writing. Sometimes I sway toward too much social media and not getting any writing done. Lately I've tilted the other direction, and haven't been participating as much. I'd like to fix that. Is there any other social media that you plan to use for your writing? I've heard good things about Tumblr. I'd like to check that out once I get around to it. I occasionally update on Facebook and Google Plus, but since I've had those for longer, they're more focused toward my personal life. I don't want to bombard friends and family with lots of writing updates if that's not what they signed up for. Do you have any other sites besides your blog/Twitter feed? 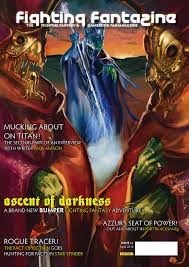 Neil Rennison said that 2012 would be the year of the gamebooks, and I think he was right. 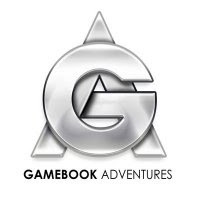 It seems like the last couple years have really seen a resurgence of interest in gamebooks. It may not have hit the mainstream yet, completely, but a number of talented individuals have started getting together and saying, "hey, this is an awesome field, let's make some awesome work in it." With new material being created in gamebooks for the first time in over a decade, I think it's just going to keep getting bigger. So there we go - follow Ashton's blog at http://www.ashtonsaylor.com/ and follow him on Twitter (he is also @AshtonSaylor). Also check out the Children of New Green Nepal and keep an eye out for future books by Ashton. You heard it here first.